Welcome to the last day (Day #4) in this week's Chocolate and Sesame Series, and the first day of Chocolate, Sugar and Spice Theme Week. Being located in Northern California, it's easy to find local wineries to visit. 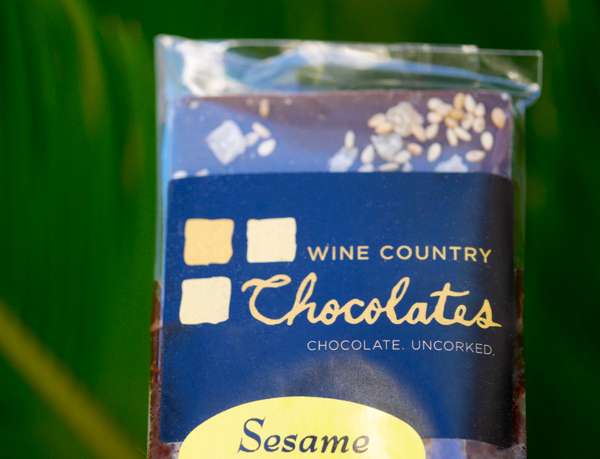 In the case of Wine Country Chocolates, located near several wineries in Sonoma County, they operate tasting rooms filled not with bottles, but rather chocolate confections, barks and bars. I found today's Sesame Ginger Bar after after taking a wrong turn while driving in the Sonoma area. Happily, this led to discovering Wine Country Chocolates' Glen Ellen location on a tree-lined, meandering country road. This Sesame Ginger dark chocolate bar was sprinkled with small pieces of candied ginger and toasted white sesame seeds. Ginger is a great spice and complement to chocolate. And this bar achieved a nice, balanced blend of flavors.